Scotland's shellfish industry is at risk from a tiny invasive species from Japan thought to be spreading with the help of climate change, researchers have warned. 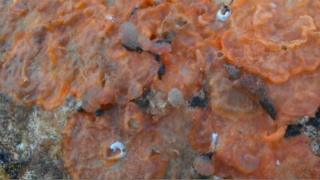 Schizoporella japonica is a primitive but prolific orange-red sea creature found at a quarter of Scottish ports. While most invasive species move from south to north, S. japonica is a rare southward-spreading threat. It has been found in fewer than one in 10 harbours in England and Wales. University of Edinburgh marine researcher Dr Jennifer Loxton told BBC Scotland's Landward its spread is likely to have been enabled by climate change. As sea ice recedes in warmer seas, more shipping trade routes are being used, and with them cold-resistant species such as S. japonica can spread. "I stumbled on it completely accidentally up in Orkney back in 2010," Dr Loxton said. "For most of us, not really much of a problem at all, it's just an irritant that you've got to scrape it off your boat, but the one thing that we are worried about is with aquaculture, in particular mussels and oysters because it can decrease the value by growing on their shells. "And in some cases if it really gets going, it can even smother mussels." The orange growths that can been seen on hard surfaces are made up of thousands of individual bryozoan animals that build a collective skeleton colony. The aquatic invertebrate animals are likely to be "hitchhiking" their way around the UK by encrusting ship hulls and tagging along on marine industry infrastructure such as floating components of marine energy equipment and aquaculture nets. "It's also, we think, moving around with some of the industry that we do here in Scotland, so fish farms but also renewable energy industry, so we've been finding it on wave and tidal turbines." Researchers have been working with councils in highly affected areas such as Orkney, and their data is helping schemes such as the Dornoch oyster restoration project take action to minimise the risk of invasion and safeguard marine habitats. You can see more on this story on Landward on Thursday on the BBC Scotland channel at 20:30, or Friday on BBC One Scotland at 19:30.